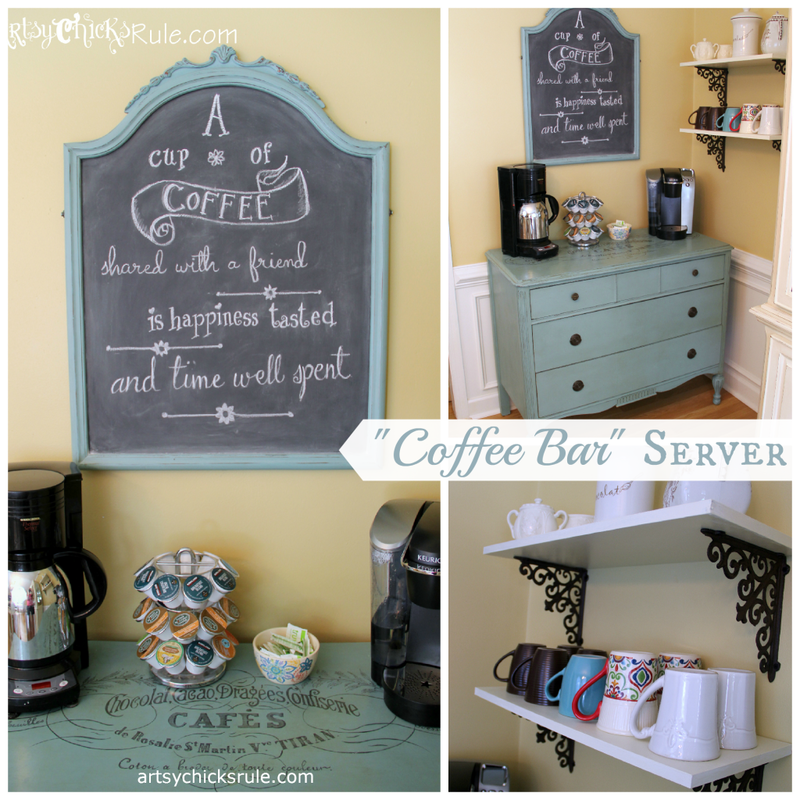 “Coffee Bar” Server w/Shelves – It Moved! 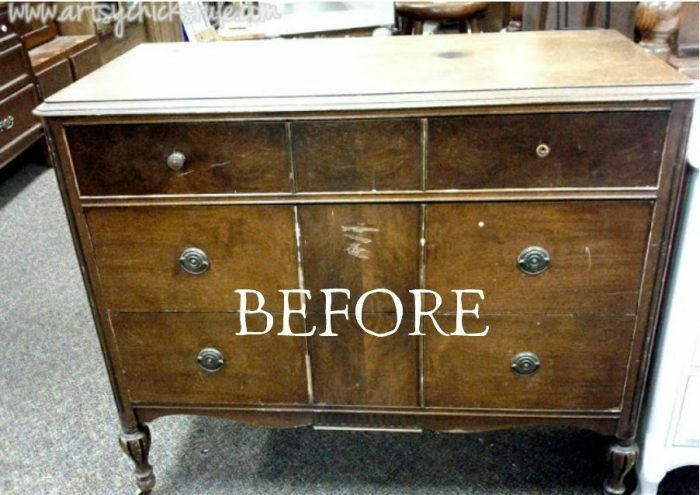 If you read my blog, you might remember this old antique dresser I picked up at the thrift store and turned into a Coffee Bar in this post here. All the details on the actual dresser turned “coffee bar”, paint (Annie Sloan Chalk Paint), graphics (The Graphic’s Fairy) are on the post in the link above. BUT I did move it to another corner in the same room, my Dining Room. And I also removed the framed area around the mirror and mounted the chalk board (formerly the mirror) on the wall above which I like SO MUCH BETTER. I made & put shelves up for the coffee mugs to go on the wall to the right of the server as well. I created a graphic on my computer with this cute saying I found online….and hand wrote it onto the chalk board. It’s a little crooked…what can I say, it’s done by hand. I erased and re-wrote that third line twice…and I still wrote it at an angle…ha! Oh well, it has character, right? Anyway, I’m loving it all. It’s amazing what a change moving furniture around in a room can make. And it’s also amazing how just changing a few small things can create a big impact. Here is it before the “move” with the chalkboard/mirror still attached to the frame and dresser…..kinda dresser-ish, huh? How it looks now with the changes I made….and in the new location of the room. More coffee bar -ish now right? 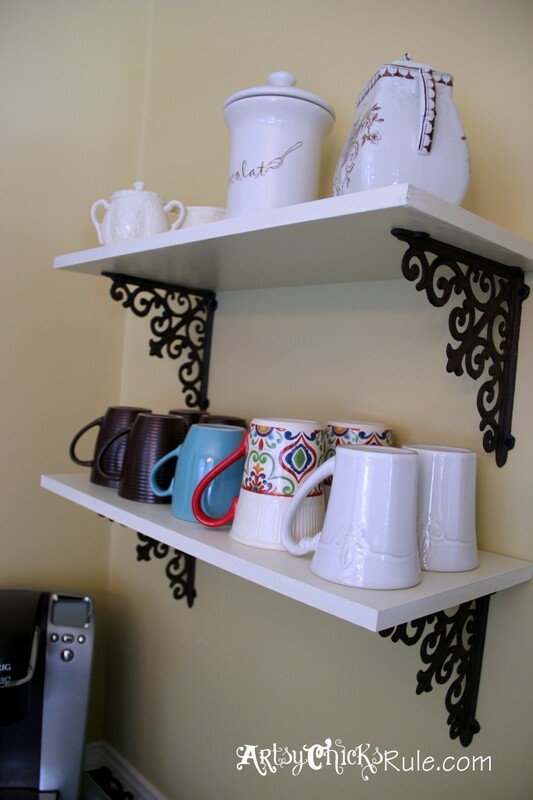 We made shelves and added brackets from Hobby Lobby for the coffee mugs and some thrifty finds. The one on the top right was a $3.50 find, circa mid/late 1800’s from England. It has yet to get it’s “pretty” paint job, but rest assured, it will soon. And wait til you see all the goodies I’ve been collecting for it. Lots of fun, great, vintage stuff! Hint: if you read my blog, you’ve seen some of it already. UPDATED: See the hutch makeover now, HERE. And last one in the new location. 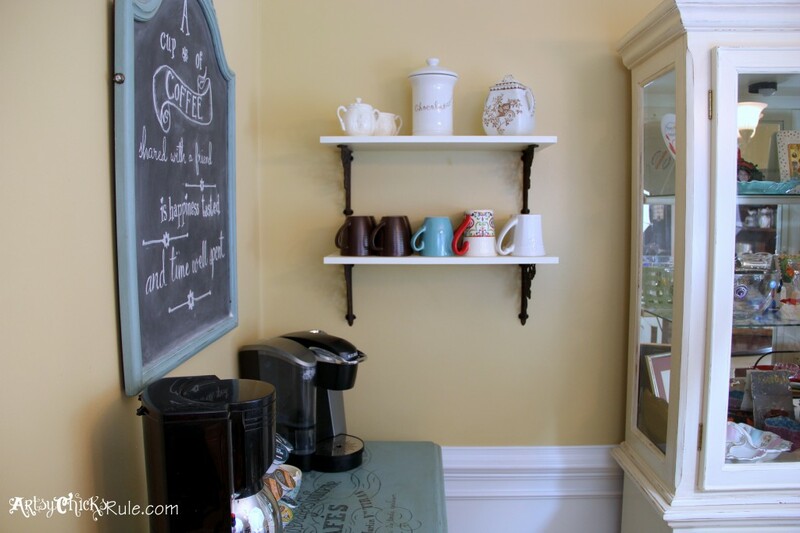 New shelves & brackets…..aren’t those brackets gorgeous? PIN this Coffee Bar server to save this idea for later! You can try adding a new element to the arrangement (chalkboard on the wall directly, new shelves, etc). Small (fairly easy) changes can make a BIG impact. Which do you like better? The before arrangement or the after? I’m including a few affiliate links to some cute coffee bar signs. :) See my full disclosure here. Nancy, this corner is so cute. I wish I had a fifth corner to incorporate this. 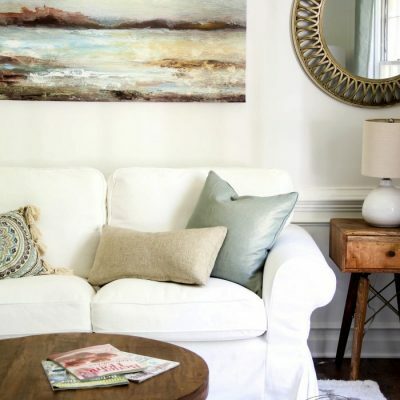 I may have to make some changes ; ) I just wrote in a post that I will publish on Friday about how such a small, simple change has such a big impact on a room. Funny the change was in my dining room too. I would love to see a full shot of your room once your new fun find is done! Have a great day! Nancy, Perfect new placement and use of your new coffee server especially with those graphics!! Love the chalkboard now that its working on its own and also your message! You see I also love sharing coffee with friends! 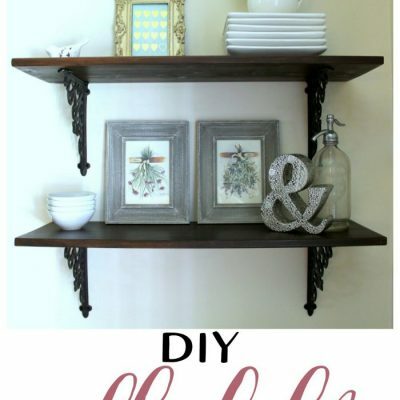 Your shelf reminds me that I have very similar iron brackets that I’ve never hung so now you’ve got me thinking! Its so amazing how just moving a piece to a new spot changes everything and gives one such a new appreciation and happiness! I’m trying to do that more! Thank Nancy and have a great day! Stay cool!! 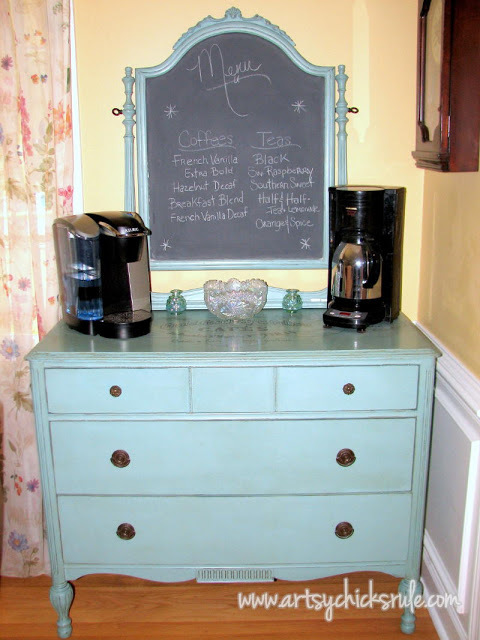 I love your coffee station – so pretty and inviting! 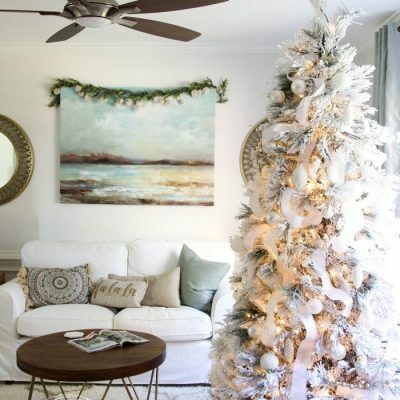 Yes, it is fun to, what I call, “shop the home” to create fresh new vignettes in other rooms. Just moved some tables from room-to-room and love how they appear so different in their new space. Fun fun fun! Looking forward to seeing what you do with that hutch. Thank you Marie! :) Oh, I love that…”shop the home”…yep, exactly! I’m looking forward to seeing what I do with the hutch too! ;) –>haven’t quite decide yet! How do you come up with these ideas? I love the new look. 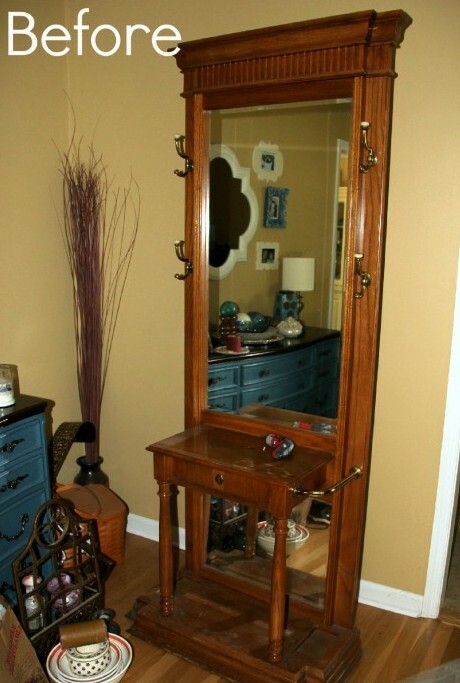 I have a similar chest with a mirror that I’ve been using in the foyer for hats & gloves storage but I always thought it looked to bedroomy. Detaching the mirror would totally fix it. Thanks for the idea. The chalkboard on the wall looks much better and changes the whole view. The whole package looks great & oh to have the space to be able to move furniture around. That would be fun! Hi Ellen, Thanks so much. I agree, it really does change the whole view! I like it so much better where it’s at now…it’s funny how things come together sometimes! I love the new set up, Nancy! Such a cute little serving nook! Can’t wait to see what you do with your new hutch! Hope you’re having a great week! Nancy! I love the little coffee nook you made. 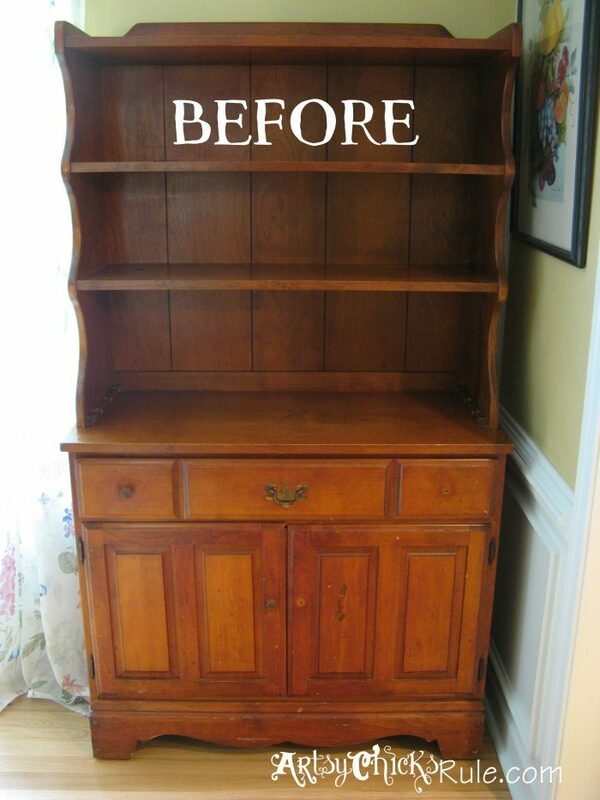 It looks so much better with the mirror detached and I can’t wait to see what you do with that hutch. 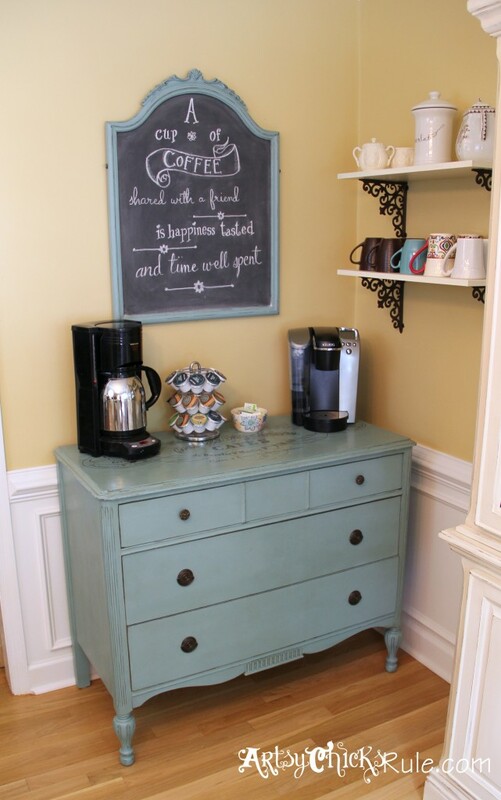 Your coffee station looks like it could be a corner of a small cupcake or bake shop. Being in the furniture business it is really interesting to see how people re-purpose furniture or take furniture that is traditionally for one room and modify it to fit a whole new purpose. 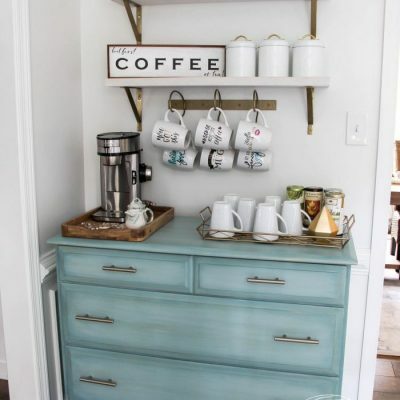 Smart move on using a dresser for the coffee bar, the drawers must be perfect for holding coffee filters, k-cups, and other coffee items out of sight. Thanks so much :) I love to use things in different ways than they were intended. The unexpected…keeps things interesting! And yep, that’s exactly what’s in those drawers. (I have another post about this dresser/coffee server that shows what’s in the drawers) Perfect place to store things! Oh it looks so cute. I really like those shelves and your mugs look great there! I love your coffee bar!! I plan on putting one in my kitchen too!! 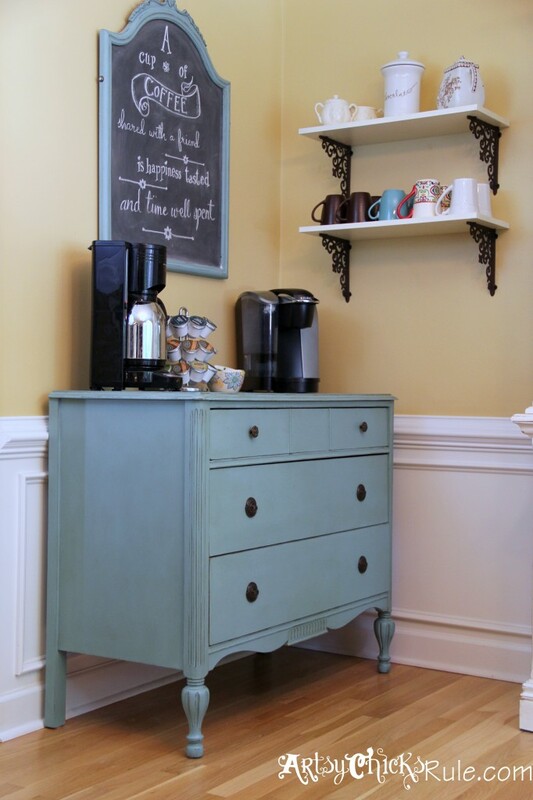 A coffee bar is such a fun idea! I love that little cabinet… and the shelves are adorable too. Can’t wait to see what you do with that hutch!! Hi Krista! Thanks so much….it really is a fun little spot. And even more so now that I’ve moved it and changed it up a bit! I love it – no matter where you move it! 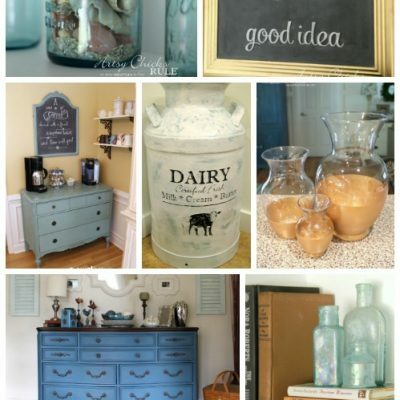 I want to chalk paint everything in my path now – especially a mirror – that chalkboard is fabulous! Just popped over from Eclectically Vintage on Facebook to take a look and I love this piece as a coffee bar! I have a little dresser that has had many “lives”, and this might be a contender for it’s next purpose. 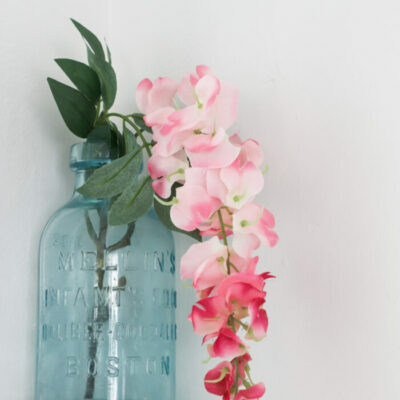 This is so darling (and practical!) Thanks so much for the inspiration. That looks AWESOME! I love your chalkboard! Ohhhh…I love it! It makes me wish I liked coffee!!! Can’t wait to meet you at Haven!!! Hi Christina :) Thanks so much!! Yes, I only drink it every once in awhile but it’s great when friends/family are over! I’m playing catch-up, Nancy, so I’m stopping by to see what you have been up to and low and behold, I’m loving the move for your coffee server. Now it kinda just tucks back in that corner, but the server color really makes it pop. Looks great! 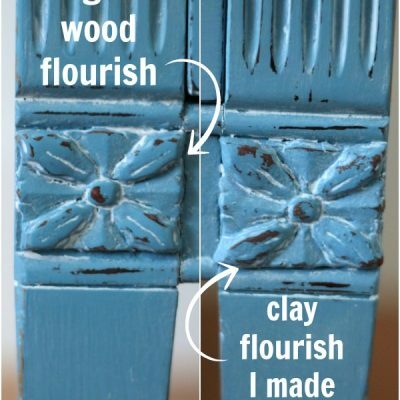 Hi – I have an old antique dresser that I’ve been wanting to paint and couldn’t figure out what I wanted to do. I’m loving this. I don’t plan on using It for a Coffee Bar – but needed to do something in the bedroom. I’m really toying with making it into a diaper changing dresser – or maybe I’ll just paint it and leave it for myself. Thanks for the great idea! I’m printing it off for my “wants” file. I love this!!! What kind of coffeemaker is the other one, not the Keurig? Thanks! Thanks Gaby! It’s old and nothing fancy! ;) Black & Decker Thermal Select. I LOVE THE AFTER!! IT IS A WONDERFUL COFFEE STATION. Thanks so much! We really do enjoy it! Both! I love rearranging. It’s ‘free’ and gives the feel of ‘new’…. Two great things! You probably were over-the-moon in love with the old….and now you’ll be equally in love with the new… What fun homemaking is!! Good job!! Keep at it! how do i send you a pic? i just posted the final color, but i havent found new drawer pulls and havent put the coffee makers on it yet, but it is ALMOST done!!! i just posted another pic on my facebook, you cant see it there?